In the competition organised by the publishing house Sonzogno in 1888 for an opera in one act, first place was won by the work of a promising twenty-year old composer: Cavalleria rusticana. Right from its debut at the Teatro Costanzi in Rome on 17 May 1890, Mascagni’s opera was met with well-deserved and amazing success, due to its highly topical subject, the novella of the same name by Verga reduced to a libretto by Guido Menasci and Giovanni Targioni-Tozzetti, and music which, from the arias of the main characters to the duets, from the prelude to the famous intermezzo, it is pervaded with an unequalled passion. Cavalleria rusticana is a story of tormented love, burning passion, jealousy and vendetta which comes to a bloody end on Easter Sunday. In the moment in which Christianity celebrates the triumph of life over death, there is no space for atonement or pardon for the characters in the opera. Only rough justice at knife-point will have the power to vindicate lost honour and the disgrace of betrayal. 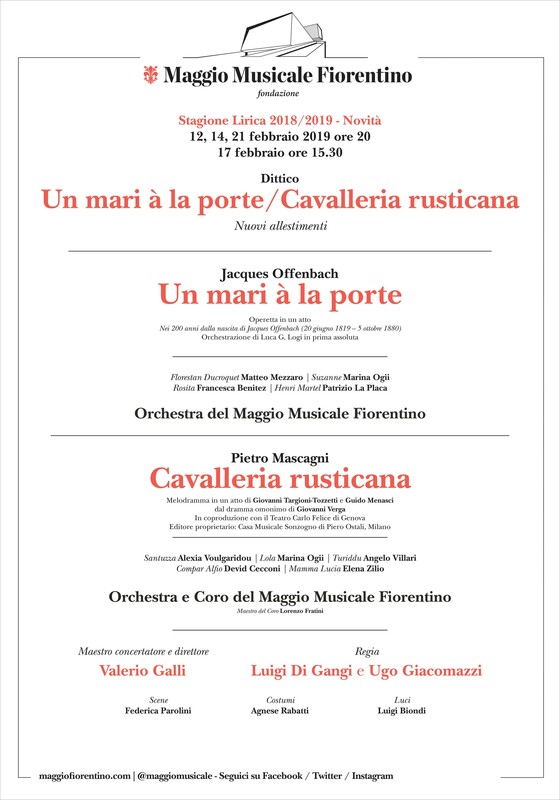 On the celebration of the two-hundredth anniversary of the birth of its composer, the operetta by Jacques Offenbach, Un mari à la porte, represents the ironic and carefree counterpart to the passionate drama by Mascagni. Considered as one of the founding fathers of the operetta genre, having composed about one hundred, Offenbach was the representative of the joie de vivre in the Paris of the Second Empire, but also a sardonic critic of the vices of society at the time, which he parodied in his work. Un mari à la porte is a mini-comedy of misunderstandings. The main character is an impresario of operettas who is fleeing from his creditors and a bailiff, and who finds himself by mistake in the bedroom of a married woman, Suzanne. The resulting series of misunderstandings and exhilarating scenes is accompanied by the brilliant music of Offenbach, who moves lightly to the rhythm of waltzes, as is the case with the highlight of the operetta, the “Valse tyrolienne” sung by Rosita.